This week at PopMatters, I wrote about Papers, Please. It's a game that makes arcane bureaucracy both enjoyable and terrifying. The beta is free to download for PCs, and I highly recommend it. It got me thinking about the difference between an "educational game" and a game that is educational. I'm starting to think of the former as more closely related to traditional flash cards. A game like Math Blaster or Carmen San Diego is upfront about its pedagogical aims: you have to know your multiplication tables and memorize your countries to succeed. Such mechanics are barely hidden under a thin narrative veneer. 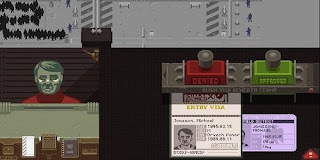 They're about facts and theorems, whereas a game like Papers, Please offers a more sociological lesson. More accurately it makes an argument: its systems are set up to comment on how power structures and familial obligations can influence a person's willingness to compromise their moral code. Once again Ian Bogost's thoughts on procedural rhetoric are spot on. I appreciate that the game does very little is done to hide this assault on your ideal. Games like Train or even BioShock have a "gotcha" moment that takes advantage of the fact that the players have been tricked into believing or assuming certain things about the game that are later revealed to be false or misleading. The insidious nature of Papers's, Please is steadily unveiled, but the health of your family will probably prevent you from doing anything to stop it. Food and shelter aren't free after all, and are you really noble enough to sacrifice yourself and your kin to save a stranger? Maybe you are, but then again, that assumes you're good enough at your job to turn a profit, something that gets increasingly difficult as new rules are piled upon old ones. Even if you navigate the ethical traps, you're still in danger of being buried by paperwork.